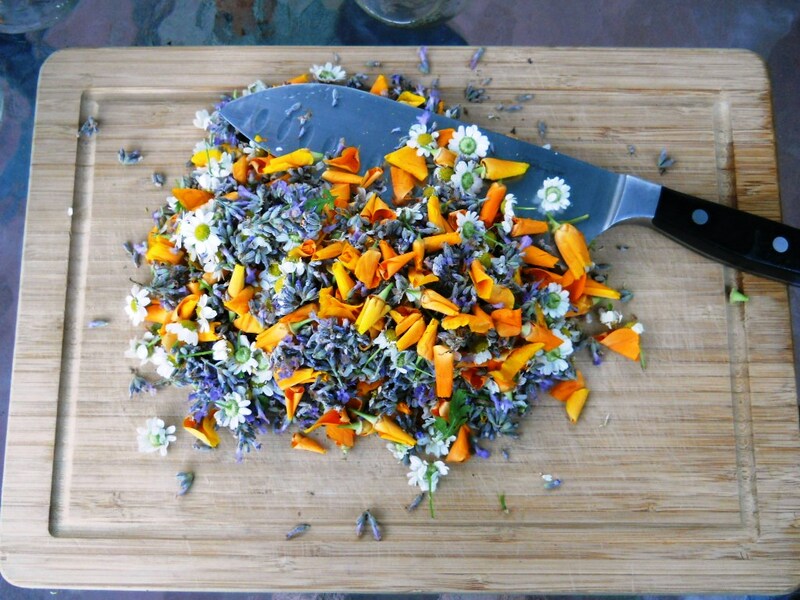 Tinctures are fun to make. Even though I’m lucky and don’t get migraines, I do know some people who do, and I thought that this tincture might be a good one to share. Maybe it will work for regular headaches as well. I’ll try it out next time I get a headache. 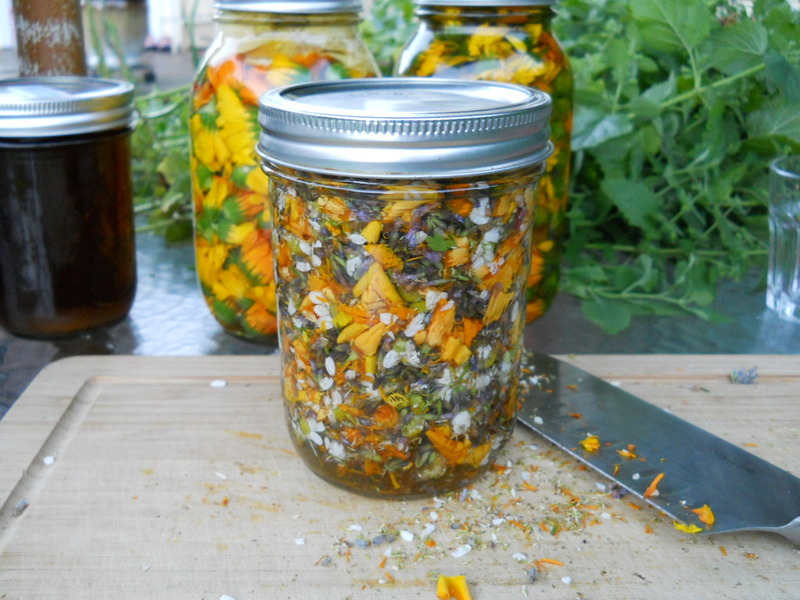 This tincture was easy to make, and since I had an abundant supply of these three flowers in my garden, it was a logical choice for me as a beginner. 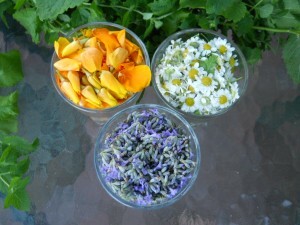 What fun it would be to be able to grow most of the herbs and flowers one needs to make a wide range of tinctures, salves, teas and even ingredients for soaps. For me it is immensely satisfying to be able to grow and create what I want in my own space and to strive for self-reliance as much as possible. 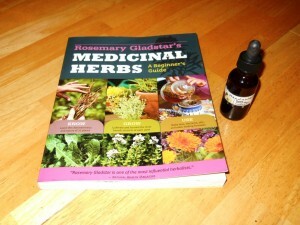 I got the following recipe out of Rosemary Gladstar’s book “Medicinal Herbs: A Beginner’s Guide. The poppy is optional but recommended. 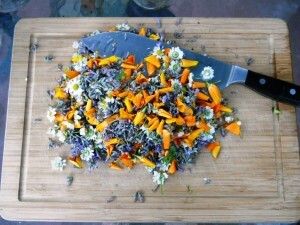 California poppy seed, leaf, and flower are better, but if you can’t obtain them, any variety of poppy seed will work. Note: Women should discontinue use of this tincture during menstruation, as it can stimulate bleeding. In fact, feverfew is sometimes used to bring on a delayed menstrual cycle. 1. Chop your herbs fine. Place the finely chopped herbs in a clean, dry glass jar. 2. Pour enough alcohol over the herbs to completely cover them by 2 to 3 inches, and then seal the jar with a tight-fitting lid. 3. Place the jar in a warm, sunny spot, and let the herbs soak for 4 to 6 weeks, shaking daily so the herbs won’t settle on the bottom of the jar. 4. Strain the herbs from the liquid. Pour the liquid into a clean glass jar with a tight fitting lid. Store in a cool, dark spot. An alcohol-based tincture will keep for many years. I made the mistake with this first tincture by not leaving a good 2 inches of head space at the top, but I did shake it almost daily and I filled the vodka all the way to the top so there was no room for air. I think it turned out fine anyway. I’m not sure how much it changed the effectiveness of the tincture since I added the entire feverfew bud instead of just the leaves. The tincture has a very bitter feverfew taste with a faint hint of lavender, but it is not at all offensive. I poured a little into a dropper bottle and will definitely give it a try the next time I have a headache. The drops are certainly easier on the pallet than eating a feverfew bud. Take several drops of migraine tincture and treat yourself to a hot lavender foot bath by adding a few drops of lavender essential oil to hot water. Rub a drop or two of the lavender essential oil on the nape of your neck and massage it in. You can also hold a lavender eye pillow over your eyes for 10 – 15 minutes. If you can get someone to rub your feet with lavender massage oil then that would be the best! 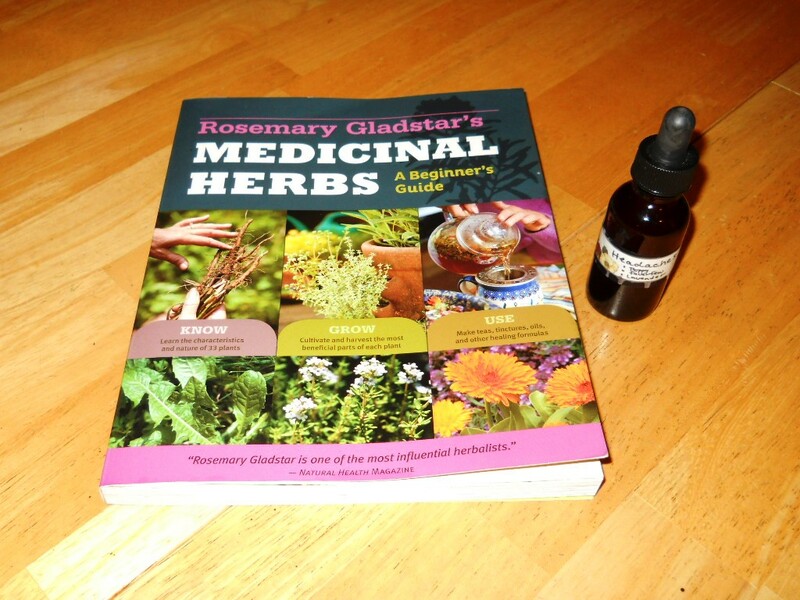 This beginner’s guide by Rosemary Gladstar is a wonderful book to get started with if you want to know how to grow herbs and process them into tinctures, salves, oils, teas, pills, poultices and so forth. It’s clear, concise, and abundant with photos and all the information you need to get started. Of course, if you want more recipes then you can go to the internet where the sky’s the limit.